Welcome to the Creations by AR Design Team Blog Hop! This month the Creations by AR Team is sharing creations made with the new Punkin Card Set Template. These templates are available for use with Cutting Machines and also as PDF's for those who do not yet own machines. Continue reading below to see how you can win this new template! I used the Silhouette Cameo to cut my pieces from 12" x 12" Bo Bunny Weekend Market pattern paper. For the card and place card pumpkins, I added the optional smaller pumpkin layer, adding score lines where the pumpkin pumps are are the cut panels. 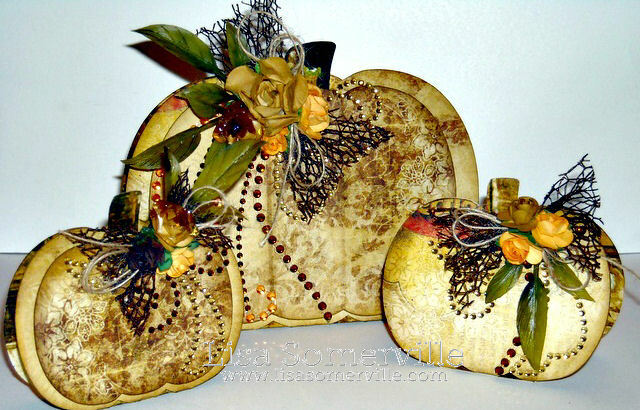 All cut pieces are sponged with Ranger Gathered Twigs Distress Ink, and embellished with Zva Creative Crystal Flourishes (CR-04CR-105/CRB-05CB-105), Mini Roses and pieces of Brown Net Ribbon that was tied with Jute. To participate and be eligible to win, simply leave a comment on each designers blog hop post by Sunday, November 4th Midnight EST. Winners will be announced November 5th on the on the Creations by AR PCP Group and Facebook Page. After visiting all the designers blogs and leaving comments, be sure to leave a comment on either the Creations by AR PCP Group or Creations by AR FaceBook Page, that you completed the hop. Wow! Your pumpkins are so adorable! Love them!! Lisa, The crystal details are stunning! Gorgeous! Beautiful choice of papers and the embellishments are just wow! These are so pretty. Love the paper and embellishments! Oh boy, they are adorable. Love the embellichments and your papers. What a great choice in papers. The bling is a great added piece of fun. Great job. Your papers and ornamentation are just lovely on these Lisa! These are adorable and love you can use from Halloween through Thanksgiving. Nice job. You rocked this release! Perfect fall feel with your choice of paper and embellies.....wow! I absolutely love the vintage look you gave to this set. Bravo! Lisa, I love, love the way you designed this set! This would be such a cute gift or a fall decoration. What a fun vintage look. Love all your embellishments. Thanks for the fun hop! Oh Lisa, these are just breath taking. very pretty, really like how you made matching place cards for the card. Vintage looking and blinged up at the same time. Love it. Wow Lisa! So beautiful, love the colors and bling! These are just gorgeous Lisa! Lisa, these are simply beautiful! My mouth keeps dropping as I go to each post to see the projects for this fun fun cut fill. Absolutely stunning stunning stunning...wow!!!! Gorgeous!!! Wow - your Punkin Pumpkins look just fantastic, Lisa! Simply gorgeous! I have no words to descrive how beautiful your pumpkins are. I love the paper you used, the set looks so nice. Lisa, these are deliciously gorgeous! The crystals give it just enough glimmer and shine. This is so creative! I thought it was made with fabric at first. It would look lovely on the dinner table, or perhaps as a centerpiece! I love all of the embellishments! Beautiful! Lisa, the colors are beautiful. Great job on challenge. Really love how you have done your pumpkins I would never have thought to do them like this but WOW!! Nice touches with adding the brown net, roses and jute. Still, you were able to keep a bit of the rustic feel, which lends itself to the autumn season.